Guasima herb better known as the Mutamba belongs to the Sterculiaceae Family. 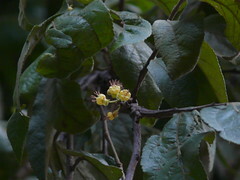 The name of the herb originated from the Mohican language .The tree is not more that 20 meters and the diameter of trunk is between 35 and 60 cm.The leaves are oval in shape with tiny yellow and white flowers. The plant also bears fruits edible by human being. Mutamba has a long history of serving mankind as herbal medicine .Though the herb is used by the tribe for a long period but modern medical science accepted its beneficial properties only after the researches that began in 1968. Mutamba is known to contain some magical element .The Mayans used it to treat evil spells and magical illness. The bark of Guasima is rich in tannin, antioxidant and proanthocyanidins. Another key property of the Guasima is the plant has an abundance of procyanidin B-2.Their property is known to prevent baldness and hairfall.The scientists of Japan confirmed that procyanidin B-2 is safe and can be used as a hair growth agent. The other independent scientists also accepted that procyanidin B-2 can be used as anticancerous and antitumorous agent .The chemical is also known to protect our kidney and maintain lower blood pressure. The bark of the Guasima is known to contain kaurenoic acid known to have anti fungal and anti bacterial properties where as the leaves are rich in caffeine. The plant is known to contain the following chemicals: sitosterol, kaurenoic acid, procyanidin B-2, caryophyllene, farnesol, catechins, procyanidin B-5, friedelin, procyanidin C-1, and precocene. The inhabitants of lower land Mexico use the fruits and bark of the plant to treat uterine pain, diarrhea and hemorrhages. The Mayan healer of Guatemala boils the bark of the tree and uses it for treating regular stomachaches and stomach inflammation. The indigenous inhabitants of Amazon also recognize the benefits of Guaism Herb. They use the plant to treat syphilis, bronchitis, asthma, diarrhea, kidney problems and many similar complications. Apart from the mentioned region, the mutamba is also recognized as a herbal medicine by numerous tropical nations .The Belizean uses the leaves and bark for medicinal purpose. The herbal medicine practitioner usually makes potion out of the bark of Mutamba .They boil the chopped bark in 3 cups of water .The same potion is given to the patient to treat various physical complications .The Belizean believes in the healing power of the Mutamba. The unique potion is used to treat complications like diarrhea, dysentery, prostate problem. The potions also recommended act as a stimulant to help childbirth. A stronger extraction is used to treat external complications like rashes, infection and sores. In Brazil the medical practitioner derives an extraction form the bark to detoxify blood, promote perspiration, suppress cough and clean blood. The Brazilian also uses Mutamba for treating regular complication s like coughs, fevers, pneumonia, asthma, bronchitis, liver problems.